Solar flare viewed January 23, 2012. 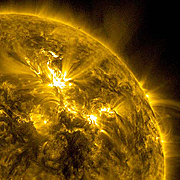 NASA Solar Dynamics Observatory image. Although it was billed as the strongest for the past eight years and coincided nicely with the American Meteorological Society (AMS) annual meeting in New Oreans, this week’s solar storm apparently had a limited effect on GPS receivers and users. A large solar flare began at about 10:38 p.m. January 22, according to the space weather Laboratory at NASA’s Goddard Space Flight Center in Greenbelt, Maryland. Less than two days later, the resulting coronal mass ejection (CME) collided with Earth’s magnetic field, producing a variety of ionospheric effects. NOAA’s Space Weather Prediction Center rated the solar radiation storm as the largest since October 2003, categorizing it as a "strong" — or S3 (with S5 being the highest) — storm. In anticipation of the storm’s arrival, the National Oceanic and Atmospheric Administration (NOAA) issued a warning to the aviation community. As a precaution, several airlines including Delta, Air Canada, and Qantas rerouted a handful of flights that crossed polar regions, where solar storm effects can be most pronounced and affect HF communications and GPS signals used for navigation. However, because the CME struck the Earth’s atmosphere at an angle, rather than head on, the effects were weaker than they could have been and caused little noticeable effect on GPS satellites or receivers. The storm did, however, produce impressive display of “Northern Lights” — aurora borealis — and presages increasing activity expected from the sun as it approaches the solar maximum in the current sunspot cycle. Three space weather phenomena account for most GNSS errors: total electron content (TEC)–induced delays, scintillation, and solar bursts. As GPS signals propagate through the ionosphere, their speed and direction change in proportion to the varying electron density or TEC along the line of sight between the receiver and the satellite. This affects the GPS range observable, adding a delay to the code measurements and an advance to the phase measurements. Scintillation, a distortion of radio waves’ phase and amplitude, creates rapid variations in signal power, reducing the received power and phase coherence of the GNSS signals, which can cause a loss of lock on the signal. Solar radio bursts begin with a solar flare that injects high-energy electrons into the solar upper atmosphere, producing RF noise that can degrade GNSS signals. A recent AMS report highlighted the vulnerability of GPS-dependent critical infrastructures to disruptions caused by solar flares and other space weather events and offered recommendations for making GPS service more robust.